Why the Need to Fundraise? Where do the donations go? We are approaching the one year mark since Team Ethan began its fundraising efforts. THANK YOU for all of your support! Your prayers, hands-on-help with my family, and financial support through Help Hope Live are allowing Ethan to achieve rehabilitation to his fullest abilities. Without all of you, and this phenomenon called Team Ethan, I do not think we would be where we are today – able to support Ethan, Zakary and Elyse with a little bit of normalcy each day. Humbled does not begin to describe how I feel. Ethan’s needs continue to be significant and the costs are, too. Even with excellent health insurance and support from the Financial Advocates at Cincinnati Children’s Hospital Medical Center, the out-of-pocket and uninsured costs are great – estimated at $150,000 – 300,000 per year, every year. Home Modifications — tens of thousands of dollars depending on scope (looking to add an all-season room to expand Ethan's living space) $50 – $60,000 approx. Long Term Care — afraid to calculate at this early stage in Ethan's recovery ($$$$). We remain committed to giving Ethan every opportunity to further his rehabilitation and live in a comfortable and positive environment. Your monetary support has been nothing short of amazing. Your future support is needed. Ethan needs all of the opportunities we can provide for him. 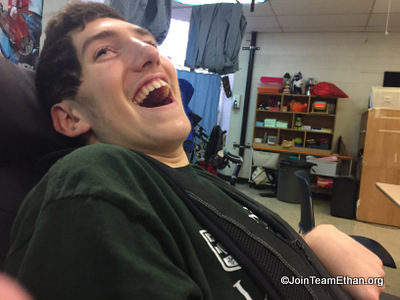 Please consider remaining active with Team Ethan. If you can, make a donation to HelpHOPELive in honor of Ethan Kadish . All donations are tax deductible. Start your 2014 Tax Planning now! Sign up for automatic monthly contributions. A contribution of: $33 per month = 2 therapy sessions. If you can afford $50 or $100 per month, it will make a lasting impact. A contribution of: $23 per month = 8 hours of nursing care. Support Ethan in the form of Chai ($18) each month. This will be a tremendous help. If we can harness the collective power of Team Ethan you can make a huge difference in Ethan's short and long term recovery. For anyone who signs up for automatic monthly contributions, Team Ethan will send you a car magnet for you to display your Team Ethan pride around town! All funds raised go directly to support Ethan – home modifications, medical treatments that are not covered by insurance such as additional sessions of physical, occupational and speech therapies, acupuncture and chiropractic visits, travel to specialists like those at the Carrick Brain Center in Atlanta and the Rehabilitation Institute of Chicago, home nursing hours, and other expenditures to help Ethan advance with his rehabilitation and recovery. The 2nd Annual Home Run Derby sponsored by Ethan’s baseball community and the 2nd Annual Eighth Night for Ethan are continuing this year. Did you plan and execute a fundraising event last year? Would you like to repeat it? Let us know! We will continue to look to all of you for fundraising ideas. There were too many events to recap this past year, and we appreciate each and every one of them – they make a difference and help Ethan with his on-going needs. Every dollar counts. If you are interested in planning a fundraising event – no event is too small or too large – please contact Jen Smilg (jen.smilg@cinci.rr.com) and Rebecca Carr (rcarr@helphopelive.org) or leave us a message at on our Blog site, or message us on Facebook We want to hear from you. A year ago, as I tried to understand the magnitude of our situation, it became apparent we could not fund Ethan’s short or long term needs without outside help. This was a very difficult conclusion to come to – after all, I believed I was taking all of the right financial steps to care for my family on my own, like most everyone else. But no one can ever plan financially for a catastrophic event like the one we’ve endured. We were told that the non-covered expenses for Ethan will be in the multi-millions of dollars over the years – a shocking figure that is hard to wrap my mind around. The 4,000+ members of Team Ethan have shown their support in so many ways. It is this support that gives us the energy, motivation and belief that we are headed on the right path. We have the right Team and we strengthen one another. Thank you for all of your support. Get involved – Get Active – Support TEAM ETHAN.